Proxitron vietnam - Pites Vietnam_Pioneer Innovation Tech and Eng. 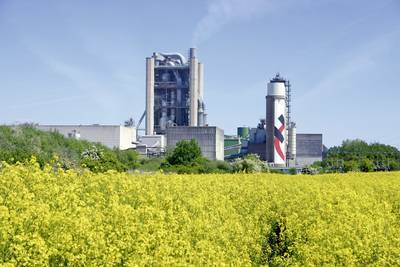 The Holcim (Germany) GmbH is a major producer of building materials in Germany and a subsidiary of the world leader LafargeHolcim Ltd, Jona/Switzerland, a group operating in about 90 countries with approx. 100,000 employees. Binding agent, aggregates and concrete are the product segments and the core business of the German Holcim group whose holding company is the Holcim (Germany) GmbH with headquarters in Hamburg. cement for over 150 years. To produce clinker, a rotary cement kiln with precalciner is used. Here 4,800 tonnes of cement clinker are produced daily. As main raw material chalk is mined, mixed and pumped to the agitators into the factory. After homogenizing with other raw materials, the slurry is filtered and transported as a filter cake via the beater mills into the furnace system. Here the filter cake is heated up and transformed into hot meal which is then fully deacidified in the calcination area. The material (raw meal) wanders in the 65m-long rotary kiln through several burning zones. At temperatures up to 1,800 °C the raw meal becomes cement clinker while passing through the rotary kiln which is inclined by 4°. Motion is provided by four hydraulic engines driving two steel shafts on which the rollers of the rotary kiln are arranged directly. To minimize the wear of the drive shafts and of the rollers, the drive shafts shift continuously and axially: the so-called pendulum motion. With two inductive analog sensors of Proxitron, one per drive shaft, the exact, axial position of the drive unit is determined and transmitted via a 4 – 20 mA output to the controller. Requirements were clearly set: sensors for this application should have 70 mm operating range, 4 – 20 mA analog output, be robust, temperature-resistant, insensitive to soil and maintenance-free. The use of an optical sensor for distance measurement was not possible under these conditions. The MKN 070.194 H S4 of Proxitron fulfils all these requirements. Constructed for ambient temperatures up to +100 °C in an extremely sturdy design, the sensor withstands harsh environment conditions. The data exchange with the sensor occurs via a RS 485 interface. The sensors can work reliably for many decades. „We have installed Proxitron analog sensors and "forgotten about them“, says Mr. Soenke Kühl, head of the electric maintenance at Holcim, Lägerdorf. “Sensors which you can rely on obviously make our work extremely easier. I would choose Proxitron sensors again and again”, explains Mr. Kühl. Proxitron sensors have always stood for high quality. The manufacturer of inductive, optical and analog sensors has specialized above all in areas where robust sensors are required. „During the last years we have boosted development in the fields of inductive sensors, light barriers and hot metal detectors / temperature switches“, says Proxitron manager Ulf Legast. „Staying close to our customers we learn what their requirements are and how to keep abreast of the times. Also „Quality made in Germany“ is obvious at Proxitron, just as it is at Holcim (Germany) GmbH“. Not only regarding distance measurement Holcim (Germany) GmbH relies on Proxitron: also Proxitron inductive high temperature sensors for ambient temperatures up to 230°C are in use at the rotary kiln to activate the thermal scanner; here the inductive high temperature sensors in M50 or M30 stainless steel housing are mounted directly underneath the cement rotary kiln, where they can resist extreme ambient temperatures.